The only way to figure out when to end your eBay auction is by planning when to start it. An auction beginning at 12:00 will end at that same time on the ending day. 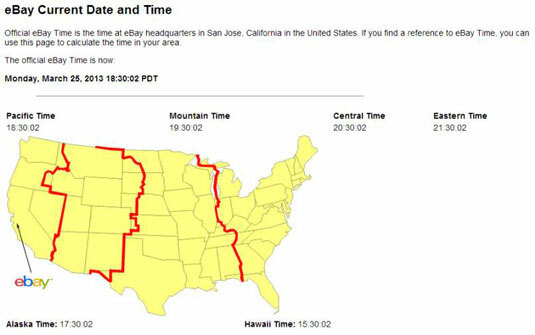 Always check your time zone and know exactly what time it is in eBay-land. 20:00 8:00 p.m. 9:00 p.m. 10:00 p.m. 11:00 p.m.
21:00 9:00 p.m. 10:00 p.m. 11:00 p.m. 12:00 a.m.
22:00 10:00 p.m. 11:00 p.m. 12:00 a.m. 1:00 a.m.
23:00 11:00 p.m. 12:00 a.m. 1:00 a.m. 2:00 a.m. This information should give you some good ideas for your own auction sales.